Jeremy loves ma pu tofu for the textures, the spice, the stew-like nature. I love it because my mom and grandma both made this when I was growing up. When I eat it, it feels like a hug from home. Most people who dislike tofu usually complain that it has no flavor. To that, I say, “You clearly don’t know how to cook tofu.” Actually tofu DOES have a subtle flavor, but I won’t get into that right now. 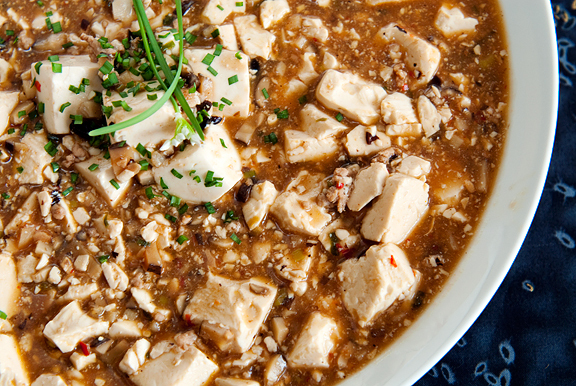 Ma pu tofu packs a lot of great warm flavors and you can make it as spicy or mild as you like (but I tell ya, spicy is gooooood). 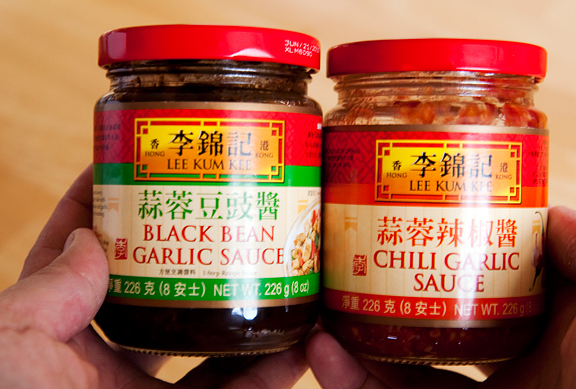 I like to add a few spoonfuls of both the garlic black bean sauce and the chili garlic sauce. Oddly enough, when I was looking for the jar of black bean sauce in my refrigerator today, I found not one, not two, but THREE open jars. You can never have enough, really. garlic black bean and chili garlic – like peanut butter and jelly, yo! In case you do decide to rush out and make this, I highly recommend buying firm tofu (not extra firm, just plain old firm) instead of silken or soft tofu. 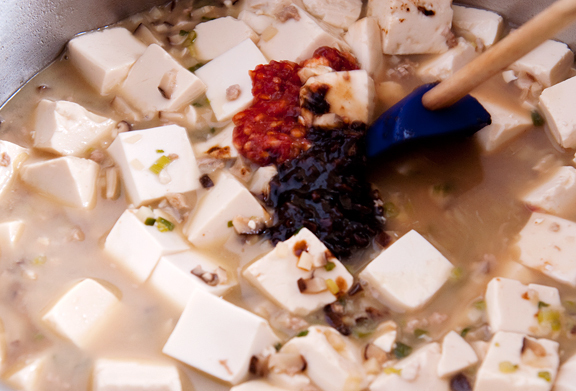 This is mostly because when you stir the pot, the cubes of tofu don’t fall apart as easily with firm tofu. I’ve made this with silken tofu before and the resulting dish, while delicious and perfectly edible, had an uncanny resemblance to vomit. Don’t say I didn’t warn you. In a large saucepan, heat the oil over high flame. Add the pork when the oil is hot and sauté. 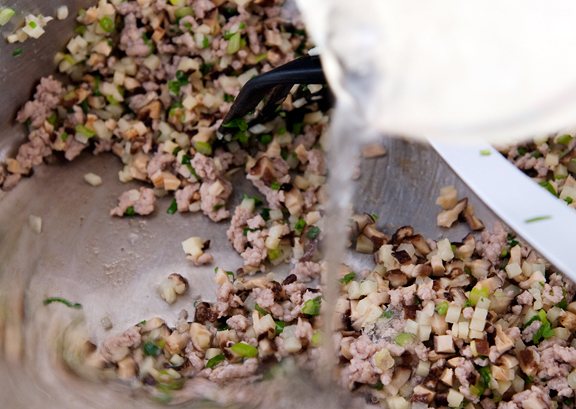 When the pork is barely pink, add the bamboo shoots, mushrooms, and green onions and stir-fry until fragrant. Pour the broth, soy sauce, and sesame oil into the pan. Let it come to a boil and add the tofu. Cover the pot and let it simmer for 10 minutes. Mix the cornstarch with the water and stir it into the pot. 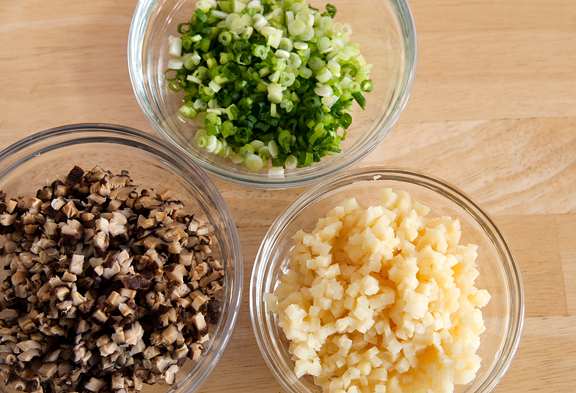 Let the mixture return to a boil and stir in the garlic black bean and chili garlic sauces to taste. Serve over steamed rice. This is one of my favorite dishes to make and eat at home.. except I use one of those cheater boxes that comes with sauce.. and you add tofu and meat. Now that I see how easy it to make I am going to make it from scratch with your recipe. Thanks Jen. Awesome as always. Sorry for your loss. Sending you and your family my best. The tofu dish looks superb! Straight from the head. The best. A delicious dish, to be sure, and comforting indeed. You convey her so beautifully Jen. Sending love to you and Jeremy and his whole family in remembering this wonderful woman. And what a good head you have on you! 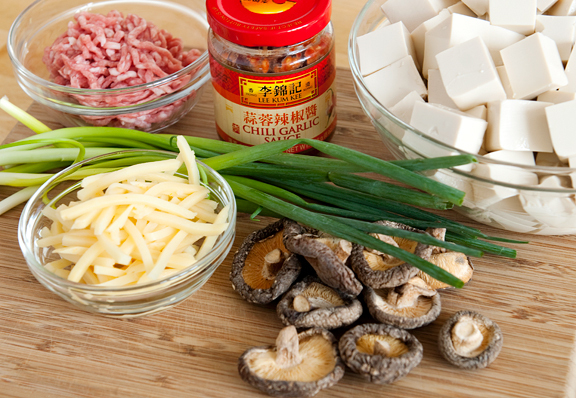 I’ve always wanted to make ma pu tofu but never dared. Maybe now I will! Safe travels and warm hugs to you and Jeremy. I’m sure you already know that you and Jeremy have lots of love and prayers going with you on this sad trip. Drive safe and please take care of yourselves and each other. It’s good you’ll be able to spend time with family. What a generous spirit you have, that in such a challenging time, you have left us with a warming dish to make while you travel. You seem so nurturing. It’s wonderful that you and Jeremy have each other. Can’t wait to try this, too. Sorry to hear about yours and Jeremy’s loss and although it is sad times for the family, it must be comforting to know that she has had a full and remarkable life. Imagine having your family around every sunday… it’s truely an amazing effort and certainly says something about what a lovely – and loving – woman, Grandma was. My condolences to you and Jeremy. I’m very sorry about your loss. Thank you for sharing about Jeremy’s grandparents…it brought back great childhood memories about my own. Beautifully written. Good thoughts sent your way! Drive safe! So sorry for yours and Jeremy’s loss. And thank you for sharing with us how precious your grandma was. I lost mine last year and my husband’s support was so important to me. Take good care of yourselfs. Cariños. Thank you so much for this recipe. 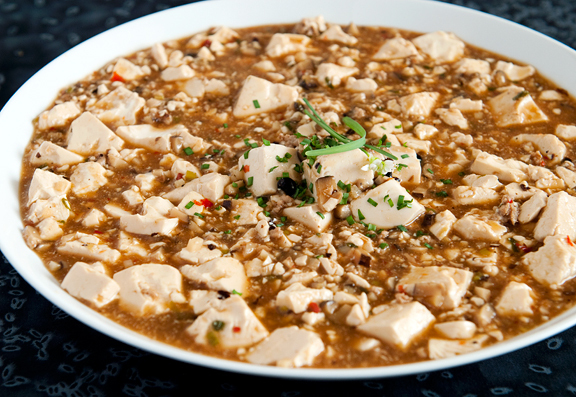 Ma Pu Tofu is one of my favourite dishes to order (that and Shrimp with Lobster Sauce). Condolences for your loss of a wonderful woman and role model. Her legacy of love and family lives on. 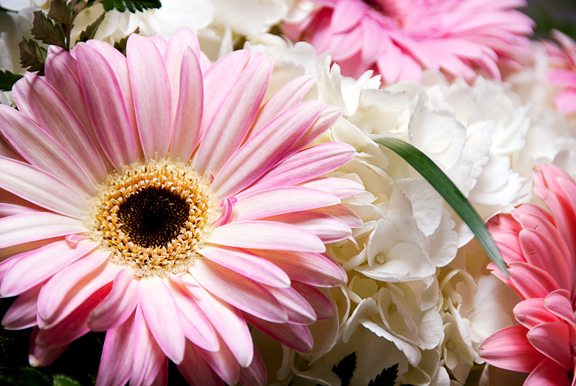 Love the pink flowers (I AM the chick who has the pink laptop mouse, you know) and the memories of Jer’s Grandma. I’m wishing you both some comfort and big hugs. Looks like a nice bowl of spicy (yes!) Ma Pu Tofu was definitely in order. Safe travels, Jen. I do not eat sweetners. I use fermented black beans often- do you think it would work in this? Probably a bit different but hopefully ok. The thing is that I am never sure if I sub the same amount. Love your website, writing, pictures insight, DOGGIE!!!! RIP sweet Grandma. Prayers for you and Jeremy. a lovely tribute to Grandma. And thank you, thank you, thank you for this recipe. My husband and I LOVE this dish, but his mom always make it from the dreaded sauce packet bought in Asian markets. I love the dish so much I turn a blind eye to the ingredients of the packet, but now I have a true recipe for it! I cannot wait to make this! 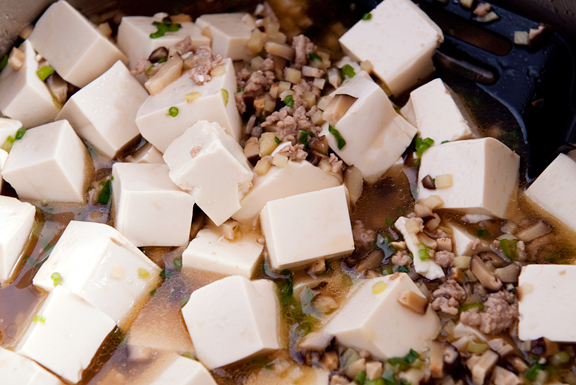 my husband makes the japanese version of this delicious dish, mabo dofu, and a trick for keeping the tofu a bit more intact is to pan-fry it first (he’ll often use crushed red pepper flakes and other spices to kick it up). the sides get seared a bit, so it stays together, then you add it to the “gravy” to soak up even more flavor. This is probably my favorite Szechuan dish. Just love the flavor combination and the slight numb feeling you get in your mouth after eating it. Absolutely delicious. I think if people have had tofu that’s tasteless, it just hasn’t been prepared well. While tofu has a subtle personality by itself, it does an excellent job in taking on the flavors of whatever it’s placed in. Thank you for sharing this great post with us! I’m so sorry for your loss. I hope the time with family remembering her will go a little way to ease the sorrow. Sorry to read this, have a safe journey. Sorry for your loss. May you and your family find strength in the love that surrounds you. I have been following your blog for a while now. Your post about “your” Grandma is so touching and one that I am sure many can understand. Following it with a yummy comfort food recipe has me planning to make this soon. kisses hugs and more kisses to you…. Jen and Jeremy, very sorry to hear about your grandmother’s passing. Jen, my condolences to you and Jeremy. Your story is such an enduring one! Such fond memories will surely keep your grandma close to your hearts no matter that she has passed to another better place. Both of you have been in our deepest thoughts. Thank you for the lovely tribute to Grandma, what an amazing woman she was. Sending our love to all of you and your whole family. XOXO. This is one of my favorite Chinese food. When my grandma was still with us every week she would cook this and I haven’t tasted any ma po tafu that surpasses my grandma’s. Whenever I eat this in the resto or my mom cooks this, I always remember my grandma. This is awesome! I will definitely try this soon. How long does it keep afterwards (for leftovers)? I love this dish! My boyfriend puts miso in it, as that is how his Japanese mom does it, but aside from that it looks much the same. Your tribute to Jeremy’s grandmother was lovely to read. I’m so sorry for your loss, and your family’s. I’m grateful for the recipe though – I made a version (version because I didn’t pay any attention to amounts of pork or tofu when I was grocery shopping, and because my grocery store doesn’t carry garlic black bean sauce) earlier this week. Delicious, warm and comforting – just what I needed when my boyfriend went on a last-second business trip. Do you have a recipe for homemade chicken broth? hi – i made this for dinner tonight and it was fantastic! THANKS! what would happen if i omitted the pork? Is there something meatless i can use instead? Charr – probably would work. I’d sub the same amount. You can always taste it and add more if you feel it is needed. alexis – it will keep for about a week in the refrigerator. Karina Wang – I don’t have one posted, but my version of chicken broth is pretty basic. Chicken bones or carcass or a whole chicken – cover in water, bring to boil, reduce to simmer and let simmer for 3-4 hours. I don’t like to add anything to it because a lot of Chinese cooking tastes funny with “flavored” chicken broth. Hannah – I think you could probably skip the pork and it would still be fine. I just made this for the first time and it was delicious. Thank you for sharing the recipe and for writing such a wonderful blog. She sounds like one lovely lady, I’m deeply sorry for your loss! I just tried out your recipe. YUMMERS! Good stuff! Thanks for posting it!